Hello! 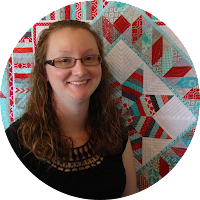 I'm so glad you've stopped by for Quiltmaker's 100 Blocks Blog Hop! Welcome to Missouri! 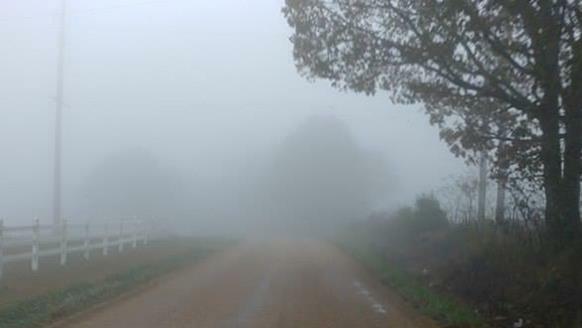 Whether you've been traveling all day to get here or you live just down the road, please come in and warm up from the cold! We've been having beautiful autumn days lately. Wasn't the drive on your way here just gorgeous?! 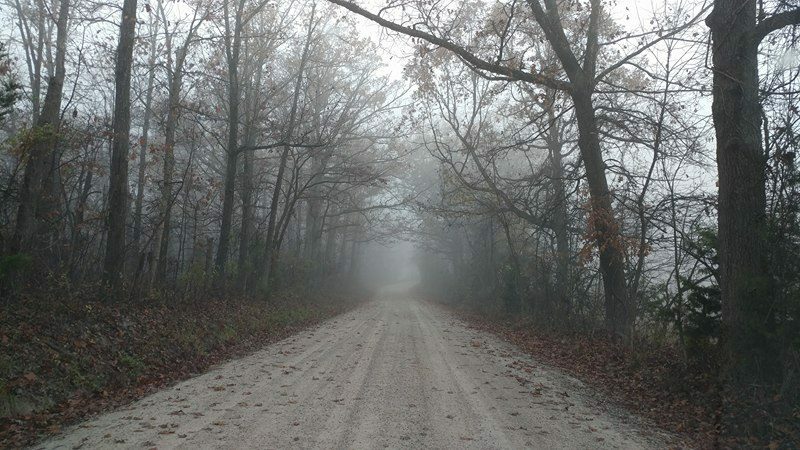 The winding roads and changing leaves really make for a beautiful drive! While in the city, did you pick up the latest Quiltmaker's 100 Blocks issue? This is my third time having a block in the magazine! For this issue, I'm included in the elite group of designers on the cover known as the "And More!" club! Speaking of the city, my block is named "Skyscraper" and is on page 50. In previous issues, my blocks have been on pages 58 and 52, so it's exciting to keep moving towards the front! EDITED TO ADD: So, thanks to Kelly over at My Quilt Infatuation, I just discovered that the blocks are in the magazine alphabetically by designer's last name. I've never noticed that before! Guess I'll never make it to the first page! Hahahaha!!! For the version of my block in the magazine, I used various orange and white print fabrics, solid white for the background, and a solid aqua fabric. I really love aqua paired with just about any other color! I used EQ7 (did you see they just came out with EQ8?!?!) to mock up a few quilts using my Skyscraper block. Aqua. I can't help it! I keep coming back to this color scheme. I really love this one! I love this one *almost* as much as the aqua/navy ones! Be sure to hop over to The Quilting Company's blog to see all the designers participating in the blog hop. There are giveaways at every stop! You can also get your own copy of the magazine on their website! Now for the best part - giveaways! 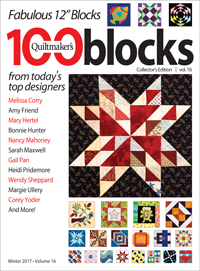 One lucky reader will receive a copy of Quiltmaker's 100 Blocks Volume 16 straight from Quiltmaker headquarters! UPDATE: Winner is comment #57 - Beth. 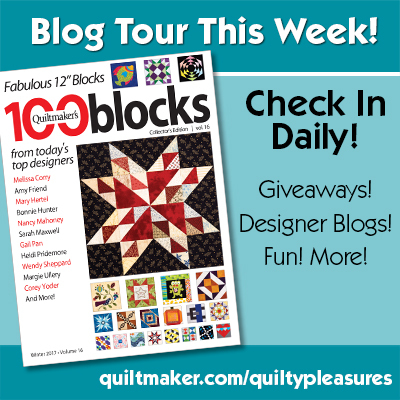 Two additional readers will each receive a copy of Quiltmaker's 100 Blocks Volume 16 signed by yours truly, five random fat quarters, and a print copy of one of my quilt patterns! UPDATE: Winners are commenters #37 - Nancy A. and #22 - Rosemaryschild. 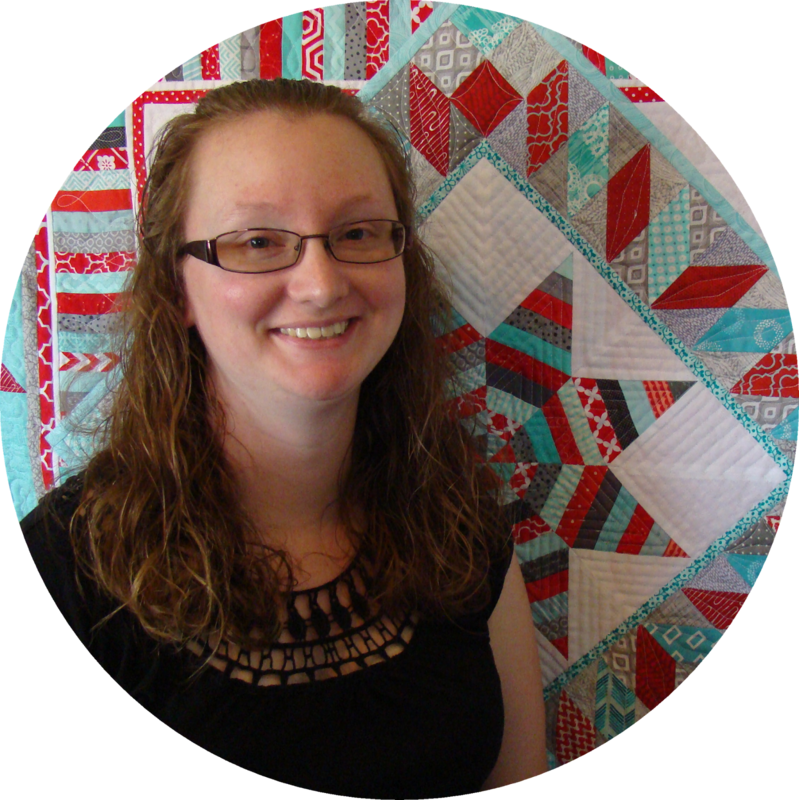 Be sure to follow my blog and find me on Facebook/Instagram/Ello to keep up with all my shenanigans and quilt finishes! (38 so far this year!) Can't wait to see you there! Safe travels as you continue your journey! Remember, it's not always about the destination, so enjoy the ride along the way! Linking up with Wednesday Wait Loss at The Inquiring Quilter, Let's Bee Social at Sew Fresh Quilts, Needle and Thread Thursday at My Quilt Infatuation, Finished or Not Friday at Busy Hands Quilts, Finish It Up Friday at Crazy Mom Quilts, Can I Get a Whoop Whoop at Confessions of a Fabric Addict, and TGIFF at What a Hoot Quilts. I rarely drink soda, but a coke on a road trip is great! Great block--looks totally different in a quilt.Congratulations! My favorite road trip snack is some type of crackers. Thank you for the giveaway. I guess I'd have to say cookies or maybe even a cake. I have a sweet tooth. Great block and the variations really pop! My favorite road snack is probably chocolate of some sort. Actually, chocolate is my go-to snack any time! One of my families favorite travel snack is red licorice. Always have to have it with us. Thanks for the great giveaway. Swedish Berries are my favourite road trip snack. Thanks for the chance to win. Outside of a good cup of coffee, my favorite road snack is GORP or trail mix. As long as it has peanuts and M&Ms, I'm good! Congrats on your 3rd run in 100 Blocks! On one of our most recent trips, we decided that a bag of mini sized Paydays was the perfect road snack. Won't melt in the car, has protein and just enough sugar to get your energy back. Love the block. I love snacking on dry cereal, especially Honey Nut Chex! Fun block! What an amazing block! I can think of many beautiful ways to use it, too. I am in the blog tour so no need to enter me in the giveaway. I love the secondary design that appears with your block. The name Skyscraper suits it well. A bag of mixed nuts is mandatory on our road trips, since we don't stop to eat often. My favorite road trip snack is an apple and a bottle of water. Some raisons when the trip takes a long time. Your block is Gorgeous Thanks Yes You are a really ..,,AND MORE!!! Whenever we head out, I need a bag of red licorice bites! Amazing how different your block looks with the different layouts and colors. I always have Goldfish Crackers when I'm on the road, easy to eat and I never have them any other time. Than you for sharing your block. I love home made senwiches with ham, cheese, greens... for traveling. Love the blocks and all the variations! It's been a while since I did a road trip...I need to fix that! My go to snack is trail mix. Salty/sweet of course...and water. I love the Blue Ridge right now beautiful colors. My favorite road trips are rides through the mountains. There is such beautiful scenic opportunities and the trees change so much each season. Great block!My snack on the road would be fruits, any kind! my favorite road trip snack is M&M's. Love your block! My favorite road snack is potato chips. Aqua is a great color -- I just finished a fish quilt with variations of aqua for the water, and am in the midst of a cat quilt where I chose aqua for the background behind the quilts. Everyone and everything looks good in aqua. My favorite road trip snack is Chex- preferably the cheddar cheese ones! I really like the secondary designs that your blocks make when put together! My favorite road trip snack is SmartFoods popcorn - the Sweet & Salty Kettle Corn flavor or the White Cheddar Cheese flavor. But be careful - they're both addicting! I love your block, especially in the on-point layout using the batiks. My hubby is a big Clemson fan, so I see working on this in my near future using (sorry no aqua) orange and yep, purple!!! It grows on ya!!! Congrats being a part of volume (sweet)16!! It's been fun following all your math shenanigans with your quilting ideas! That block is full of Wow, and I have lots of Aqua and now I will go back and see if I have any pink or navy to go with it. Love trail mix for a travel snack. My favorite road trip snack would have to be nuts. More specifically, Sahayle Nuts because they are both tasty and gluten free! My favorite road trip snack is trail mix with a bit of chocolate in it. I like mixed nuts as a road trip snack, especially cashews and almonds! Great block! My favorite road trip food is M&Ms! Congratulations on having your block in this issue. 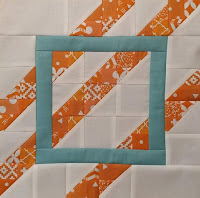 I love the way your block looks in the quilt designs you showed. Our favorite snack is either M&M's or the peanut butter in the cheese crackers. Fabulous block and I see what you love aqua. I am boring when I travel. I always make sure there are vegetable and/or fruit pieces to munch on. And lots of water to drink. Kettle corn! Really good kettle corn! My favorite road trip snack is pretzels. (And water to drink). I like the contrasting colors in your block. I love your block and all of the variations. My favorite road trip snack is popcorn. I make up a big container of it and enjoy it on the road. Thanks! I love aqua also.... it really does go with just about everything. My favorite road trip snack would be grapes or easy to eat fruits such as berries. But cookies can go almost anywhere with me. Wow, the block and the various layouts are wonderful! My favorite road trip snack is homemade cookies, doesn't get much better than that! That is a great block. Congratulations, I can see why you were picked. I like to eat an energy bar while traveling as they can keep for practically forever and aren't messy to eat! My favorite road trip snack is Trail Mix. Had to go back and re-read as I though you said favorite road trip...and then the comments didn't make sense. So I will comment on that...any trip that ends up at home as that is where my heart is. As to a snack, I think a good crisp apple makes the perfect snack and when you are done you can share it with the critters as you leave to behind...that is if you live outside the city...perhaps then it will end up in the trash can. Thanks for sharing your block. This block is so cool! And the layouts and colors are amazing! I like to eat sunflower seeds. Kinda messy but oh so good! Mixed nuts with a mixture of dried fruits will fill my tummy as I quilt and help with all the snacks in the backseat. I do not drive on long trips. I love your block. the 3-D it gives by all the layers make it hard for me to choose a favorite but your block is my pick of the day for sure! A good cup of coffee with a peppermint. Really enjoyed seeing all the possibilities with your block. My favorite road trip snack is cashews and dried figs. My husband and I try to stay away from carbs, so we low-carb protein bars and nuts. My favourite road trip snack is cheese popcorn. It's messy but tastes so good. I am a salty, crunchy snack addict, so I go for Goldfish--preferably the Parmesan flavor if I can find it! Congrats on making the cover! We always pack licorice for road trips. My favorite road trip snack are Cheeze-Its! I don't usually snack in the car. When I do, it is usually crackers or a snack mix. Great block - thanks for sharing the different colorways & layouts. My favorite "snack" while traveling is gum - I'm prone to motion sickness & gum helps. Thanks. 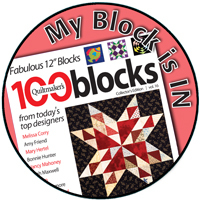 Congratulations on having your block included in Quiltmaker’s 100, Vol. 16! 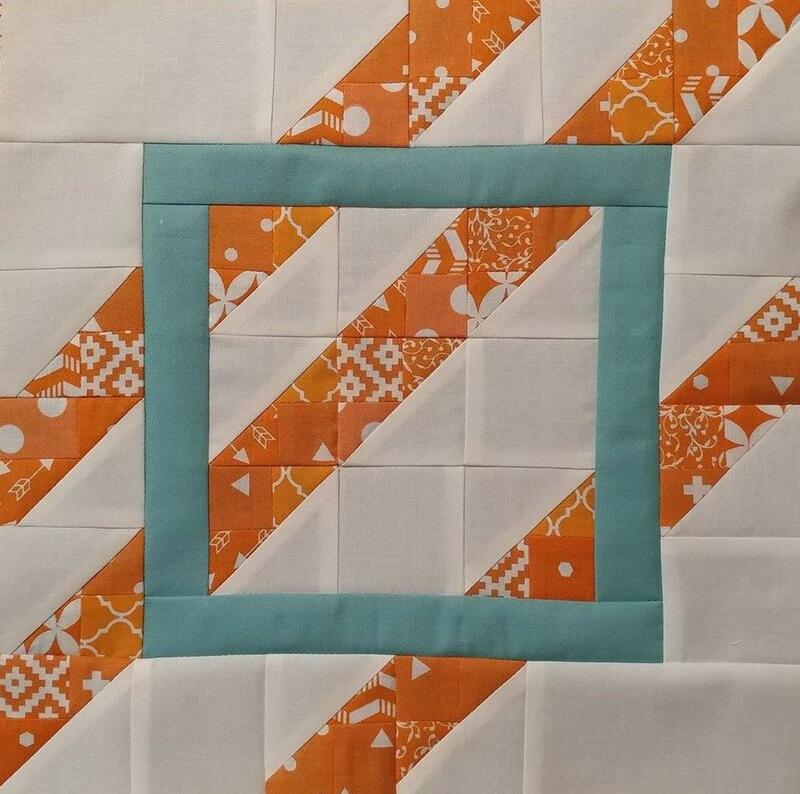 What a fun block and it looks amazing as a quilt. For road trip snack I love either trail mix or crackers and string cheese. Super giveaway! Three Winners! Woot! Woot! Thanks for a chance to play. My husband and I always pack a good bag of snacks when we go on a road trip...it always includes red licorice, some crackers, and some chocolate! I don't snack on road trips, not sure why but never have. I do enjoy an unsweetened iced tea w. double lemon though...that is my "go to" when on the road. One of my fave snacks is cheetos....but too messy for a road trip. How about some M&Ms...and Coke Zero. I'm not a great snacker in the car, but have been known to eat grapes. We drink water, but now in my state it is a misdemeanor to eat or drink in the car. Your block is very cool with that secondary pattern popping out! Thanks for the giveaways. Hawkins Cheezies are my favorite road trip snack along with coffee and water. A salted nut bar is a treat I like that I usually think of when traveling. My favorite snacks are crackers, especially Wheat Thins. Love your block, Laura! Thanks for the road trip!!! My fav road trip munchies--peanut butter pretzels and baby carrots! What's yours? Trail mix is my fave! This is easy. Trail mix with lots of almonds and M and Ms.
Great block. I love homemade chocolate chip cookies on my road trips. My family likes them, too. An interesting and modern block. Had a road trip this weekend and took sliced apples. Also like nuts and iced tea!. The third quilt caught my eye. Really like the color combinations. I love your block!! My favorite road trip snack is the trail mix my husband makes up! I like to munch on crackers and fruit when traveling! We always take Pecan Sandies cookies on road trips. I also love aqua combined with coral. My road trip snack has to contain chocolate! Congrats on your 3rd year of publication in Quiltmakers 100. Keep on moving forward , 40's next yr.
My favorite road trip snack are peanut butter cheese crackers. Salty, sweet and filling! What a wonderful modern block you created! I love to snack on cashews when we're traveling. One at a time - they go a long way! Oh this is o easy. When my sister and I road trip it is always a bag of sour cherries from the gas station. I know you've seen them used to be 2 bags for $1, now it is 2 for $3. You can see how long we've done road trips together. Wow! Your block really pops in the bright colors I love it. My favorite road trip snack is what else but chocolate. Thanks for showing so many different layout possibilities. Favorite road snack, baby carrots--no crumbs and eating them keeps you awake. We always have a jar of nuts in the car. Wonderful block and variations in color. My favorite snack on the road or any time is chocolate. Also love certain homemade cookies and Chex party mix. My favorite road trip snack is pretzels. Oh I love the secondary designs, and the aqua! Aqua, purple, white is a favorite combo of mine. Sometimes it needs a touch of sunshine yellow or sparkly grey/silver. My favorite snack is always chocolate. Almonds with chocolate chips and Craisins. Or Chex Mix. My favorite road trip snack is Twizzlers and pistachios. My favorite road trip snack is oatmeal raisin cookies. Interesting block. Kathy--I like Swedish Fish, but I have to limit them. On the healthy side I enjoy a ripe pear or an apple. If I'm on a short trip by myself, my favorite snack is M&Ms Plain. If I'm with my husband, we're on the motorcycle and it's a homemade trail mix. My favorite road snack is Gardetto's. That is about the only time I eat them as they are so tasty and it is too easy to eat the whole bag. Love your block. It looks like the squares are floating in air when the quilt blocks are assembled. Amazing. Before the necessity of a good healthy diet came our way, Wisconsin was our favorite snack stop on the way from GA to MN... those cheese curds are wonderful. Peanut butter on crackers is my favorite road trip snack. Bananas, cheese and Snickers are also in my snack bag! Your block is great! Lightly salted cashews! Yummm! Nice block. Thanks for the opportunity to win. Twizzlers, yep that stick to your teeth but nice and chewy sticks! My mother and I both like them so whenever we go somewhere together it has to go along. Thanks for running a giveaway. I go for Pepperidge farm cookies myself! viridian61 at yahoo.com. Probably Lays BBQ Kettle chips or Boom Chicka Pop Kettle Corn. They are both so addictive. Also, I love your Snowfall pattern. Red licorice and Good and Plenty! Can't travel without either of these. Nuts are always my favorite~ They are filling, tasty, salty and give me energy for the road! Skyscraper is absolutely awesome! On its own, it's great, but when added with multiple blocks, it blows me away! My favorite roadtrip snack is Peanut M&M's. The only problem is that I can't stop eating them. They never make a bag big enough. My favorite road trip snack is actually iced mocha. Tastes great and keeps me awake! Your striking block is so versatile! Thanks for sharing it! Thanks for your block and showing it in the different options. My favorite travel snack is red licorice - easy to grab and very yummy!! Love the design lines of your block! On point is amazeballs! I love mixed nuts, homemade jerky, fresh fruit and water on my long road trips! Apples and peanut butter are always my fave! Oooo - I really like that teal and purple one on black! My favorite road trip snack is Pringles sour cream & onion. It's the only time I let myself eat them. I think I made it just in time. My favorite road trip snack is trail mix. Great block! I love to pick up a Calypso Pineapple Peach Limeade when on the road. They don't sell it near me so it's a treat. Lovely block! Congratulations. And thanks for linking up to Wednesday Wait Loss.